There is not a parking problem at Plaza de la Raza. There is an attitude problem. The people working at and patronizing this institution feel that their selfish desire to drive right up to the door of their building trumps every single other user groups needs in Lincoln Park. No punk rock skaters, nor softball team moms, nor fishing dudes, nor parents with kids riding bikes or playing in the playground feel the need to drive in the middle of the park. Yet, the people at the Plaza, despite ample free public parking all around the Plaza continue to break the law and despoil a historic green space in Lincoln Park. Gil Cedillo is rewarding these entitled, selfish, people with a parking lot where they have ruined the lawn and turned an explicitly car-free space into an un-policed drive-thru. The project to turn the grass and trees in front of the Plaza into an unneeded asphalt parking lot passed through city council (CF 15-0091) a few weeks ago. The price tag for the project is $833,425. This rough map shows how much of the Lincoln Park will be paved over if the parking lot expansion happens. The massive DMV parking lot across the street from Plaza de la Raza could be opened to Plaza patrons in the evenings. Sound impossible? 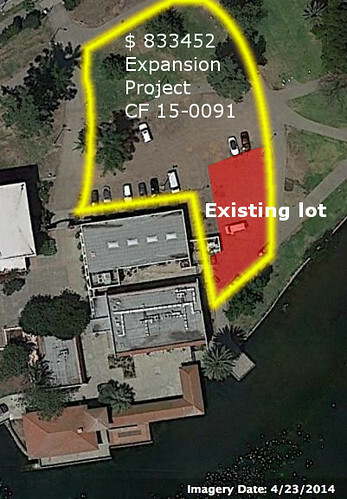 In 2011, a DMV office in San Francisco made its lot available to the public in the evening to relieve parking pressure. You can read about the Panhandle DMV parking lot opening to the public for after hours parking. Who has the back of the people of Lincoln Heights? All the joggers, the old Asian ladies doing their tai chi and calisthenics in the morning, little kids learning to ride their bikes, couples walking their dogs, kids walking to and from school, USC and county hospital workers crossing through the park – none of us count on the interior paths as much as one jerk driving to the Plaza. That isn’t fair and it isn’t right. The money going to pay for this unneeded parking could find many useful purposes in the park, but that is a post for another time. I’ve documented this abuse in the park for the past 5 years. There is an email trail going back to 2010 between the former LA park police (since absorbed into the LAPD) and the LAPD and members of my household. Our calls to ticket unauthorized cars driving on the paths and lawn have gone unreturned or were simply dismissed. If you’re upset about this issue, give Councilman Gil Cedillo a piece of your mind at 213-473-7001 or leave a comment below.